Friends Influence Who You Become. “As iron sharpens iron, so one man sharpens another.” Proverbs 27:17 NIV. I said farewell to a dear friend. I have said too many farewells too many times. His suffering is over and for that, I am thankful. But the continued loss of his company and our conversations is painful to me. In that void, I find my thoughts today are about how friends shape one’s life. You are more the product of the people around you than you might realize. You give an awesome power of influence to each person invited into your life. Friends with whom you spend time ultimately shape your opinions, values, choices, and activities. 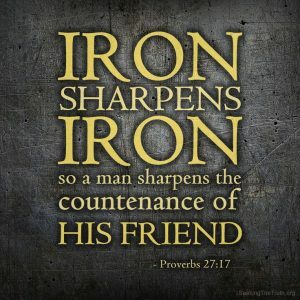 The Bible says, “As iron sharpens iron, so one man sharpens another.” Proverbs 27:17 NIV. Relationships impact your life’s direction, whether or not you mean them to do so. For better or worse, the friends you choose influence who you become. Think about that for a moment. My favorite story of a friend’s influence is David and Jonathan. Jonathan is the King’s son in Jerusalem, heir to Israel’s throne and groomed to reign. David is a teen, just a shepherd’s son from Bethlehem, apparently with no royal ambitions. After King Saul’s death, God sent the prophet Samuel to his humble home to anoint a new King. Read 1 Samuel 16:1-13. David soon found himself chosen by God to lead a nation, when all he had led was his father’s few sheep. Can you imagine the insecurities David must have felt, or the questions he had? Why? How? Why me? He would never make that journey successfully without others to encourage and help. You don’t have to make your personal journey alone. In fact, you shouldn’t try. God brought Jonathan into David’s life. In Jonathan’s heart, God put an understanding of God’s calling and anointing for David to be king, and a love for David that provided an influential friendship that would groom David to rule. See 1 Samuel 18:1-4. Their lives were bound together in covenant love (1 Samuel 20:16), reaching even to the next generation. See 2 Samuel 9:1-13. David would not have reached his potential if not for the influence of Samuel, a person of authority who recognized David’s anointing, or Jonathan, a true friend who embraced David’s Godly destiny, and Nathan, a courageous prophet who spoke Godly correction and counsel to David. Those kinds of Godly friends are essential to your life. Don, my dearest of friends since I was sixteen, once reminded me of an occasion when I had said to him, “Thank you for not letting me be what I would have been without you.” I do not remember saying that, but I hope I did. 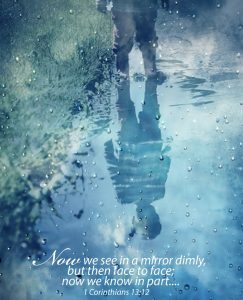 Because of the years we had spent together, I am different – my life, family, and ministry better – than would be true otherwise. And that is true of far more friends than him alone. God must have known how much I would need to be surrounded with such friends of Godly influence. More than any one person, my wife and best friend, my mother and father’s loving examples, spiritual “fathers and brothers” sharing their lives with me, staff pastors serving alongside, and gracious families in the churches we served, are influences touching my life still today. Friendships are for mutual benefit and ultimately for God’s purposes. Choose them wisely; avoid those that might be detrimental rather than beneficial. Be wary of those who would subtly change you as neither God nor you intended. Today, I pray for you to seek and welcome Godly and influential friendships. Your daily work can be a holy endeavor. People often describe their job as, “work.” Your job should be work, requiring your best efforts and the bulk of your time. For the better part of your lifetime and a substantial portion of each day, work will occupy your time, attention, energy, and effort. Your attitude can make that time pleasant as well as productive. Work can be little more than a necessity, something you have to do so to provide for yourself and family. Or work can become a drudgery, something you have to do but really don’t want to do. Or you can make your work a fulfilling joy, an activity and place where you discover the privilege of meaningful service. On different days, your experience will likely be a variety in differing proportions of all of those. The Bible is clear. “The Lord God took [Adam] and put him in the Garden of Eden to work it and take care of it. And the Lord God commanded the man, ‘You are free to eat from any tree in the garden, but you must not eat from the tree of the knowledge of good and evil.’” Genesis 2:15-17 NIV. Work was the privilege of being stewards of God’s ample provision and care. But that privilege was accompanied by a responsibility. Adam was to work and take care of the garden, free to eat of any tree in the Garden, except one, described as the tree of the knowledge of good and evil. Contrary to what most people suppose, work was Adam’s assignment rather than God’s punishment for his disobedience. The punishment was the added labor that would be required. The difference was this. At the initiative and insistence of Eve, Adam chose to ignore God’s warning, eating of the fruit of the single tree that had been forbidden to them. Adam’s failure resulted in disobedience entering into God’s creation as they had been forewarned. “And to Adam He said, “Because you listened to your wife and ate the fruit I told you not to eat, I have placed a curse on the ground. All your life you will struggle to scratch a living from it. It will grow thorns and thistles for you, though you will eat of its grains. All your life you will sweat to produce food, until your dying day.” Genesis 3:17-19 NLT. The sweat and toil of work was the horrible price of man’s minimal regard for God’s provision being enough. God appointed work itself to man earlier than his disobedience. Notice where man was to be employed? The Creator placed Adam and Eve in a garden, a picture of provision, plenty, and beauty – a fruitful place created by God, blessed by God, and frequented by Him. It seems that the difference is whether you are in God’s employ or simply trying to put bread on the table. Since God first ordained His creation to know and enjoy meaningful employment in partnership with Him, would He not provide a way for you and me to redeem our daily work and discover it a holy endeavor, rather than a lifelong struggle? The proper answer is, “Of course.” Let me share a few simple, practical truths. Choose a Godly attitude about work. Let your daily work be a holy service to God and man. “Work with enthusiasm, as though you were working for the Lord rather than for people. Remember that the Lord will reward each one of us for the good we do.” Ephesians 6:7-8 NLT. Consider the purpose of work. “Begin using your hands for honest work, and then give generously to others in need” Ephesians 4:28 NLT. Honest work provides for your needs, and supplies a surplus for sharing generously with others. The goal is not merely to get more, but to have more to give. Consecrate your work to God. 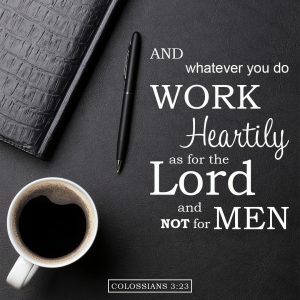 “Whatever you do, work at it with all your heart, as working for the Lord, not for men, since you know that you will receive an inheritance from the Lord as a reward. It is the Lord Christ you are serving.” Colossians 3:23-24 NIV. Do not depreciate those for whom you work. They are God’s point of supply for meeting your daily needs. But look above and beyond them to the Lord, Who is your Source. To Him be glory. Today I pray for you to dedicate your life in joyful service to God and others. Who you are is not about what you have. Admittedly, the culture and values of my father and grandfathers’ generations were very different from ours. We were taught character building values such as: give a full day’s work for an honest wage, use cash not credit, save for the future, live modestly within your means, and always be a good neighbor. In contrast, the current culture seems to entice you in subtle and not so subtle ways to want more than you can afford, to desire more than God provides, and to crave everything your neighbor has, and more. In their subtlety and practical application, those more recent values are inaccurate and deceiving, even seductive. Material possessions can become a little too important, as well as becoming an inaccurate measure of success and significance. Who you are is not about what you have. God made you so much more. Your possessions, or lack thereof, should not determine your identity. Your true identity is found only in Christ. How has this change come about? There is a false philosophy that began as early as man’s origin in the Garden of Eden, a false philosophy that proudly claims that you can have it all, and you can have it now. Read the history, Genesis 3. That was exactly how the devil seduced Eve and deceived Adam. They had it all, except for one small thing. The fruit of every tree was theirs to enjoy, except one. “The Lord God commanded the man, ‘You are free to eat from any tree in the garden; but you must not eat from the tree of the knowledge of good and evil.’” Genesis 2:16-17 NIV. Somehow, Eve was deceived to believe that without that one added thing, God must be withholding something good from her that she could obtain apart from God. Well, you know how the story goes from there. It does not end well. Too many people have spiritually and financially bankrupted themselves trying to have it all now, and at an even higher price have impoverished their souls in the process. In God alone, security and contentment are found. 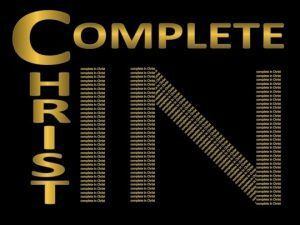 “In Him dwells all the fullness of the Godhead bodily; and you are complete in Him, who is the head of all principality and power.” Colossians 2:9-10 NKJ. The Apostle Paul was certain, “Godliness with contentment is great gain. For we brought nothing into the world, and we can take nothing out of it. But if we have food and clothing, we will be content with that.” Read 1 Timothy 6:6-10 NIV. You were never intended to have it all. And it is not practical to have it all right now. Be patient and trusting for God to provide what you need. When Jesus said, “Don’t be greedy for what you don’t have. Real life is not measured by how much you own.” Luke 12:15 NLT. It was not Jesus’ suggestion; it is His continuing command. Following the wisdom and counsel of the Word of God will spare you a lot of needless grief and worry. Meanwhile, be content and faithful with what you have. “I have learned to be content whatever the circumstances. “Read Philippians 4:11-13 NIV. Our common problem is wanting things before God provides them and acquiring them without regard to their cost to our soul, now as well as later. Be grateful and content for the things you have while trusting God to provide things you want, if pleasing in His sight. You are best to live with this conviction born of God’s Word, “My God will supply all your needs from His own glorious riches, which have been given to us in Christ Jesus.” Philippians 4:19 NLT. Greed is the enemy of contentment and can be defined as, “an inordinate, unholy insistence of wanting more than God has yet provided and attempting to gain those things however you can and as quickly as you can.” That will never work out the way you hope. “Now, may the God of peace . . make you complete in every good work to do His will, working in you what is well pleasing in His sight, through Jesus Christ.” Hebrews 13:20-21 NKJ. Amen! Today I pray for you to be content with what you have and trust for all you need.